Charles Nelo Sangster is an ex- priest who had been de-frocked and has just been released from prison where he had been sent for three years for forgery and fraud which he believed he had done "for a good cause". He had been called Nelo because his father had been born on Christmas Day and decided that all his children should have second names which were anagrams of Noel. 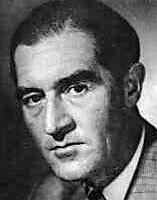 His brother Edward Leno Sangster was a highly respected barrister and Member of Parliament (Conservative of course). Nelo is six feet tall with "the physique of an international rugby lock forward, a face like a prize-fighter and ginger hair, .... a nose like a squashed pimento" and handsome blue eyes. He is the narrator throughout and is strong on Biblical quotes. He had joined the church "because I wanted to help people and it seemed the most convenient way, and also because I had - after leaving public school - just spent two years abroad in mild dissipation and idleness making a gentleman of myself and studying languages, and was suddenly overcome - apart from the languages - by the waste I was making of my life." He had had some problems with his tutors about his interpretation of Christian doctrine during his three years at Winchester Theoological College, but had survived two curacies before, aged a little over 30, and thanks to family influence, he had got his own living near Barnstable. He tells us, "God didn't choose me. I chose God. I was happy to do so. If He at any time found me unworthy, I told myself, he could always sack me. Which, of course, He did." Victor Canning (1911 - 1986) was born in ﻿Plymouth, Devon, but in the mid-1920s the family moved to ﻿Oxford where his father had found work, and Victor attended the Oxford Central School. Unable to afford university, Victor went to work as a clerk in the education office at age 16. ﻿In 1934, his first novel, ﻿Mr. Finchley Discovers His England, became a runaway best seller. He gave up his job and started writing full-time, eventually producing 61 books as well as numerous short stories. He also wrote under the names of Alan Gould and Julian Forest. He served during the war in North Africa and Italy, and was discharged with the rank of major. His book, The Golden Salamander, was one of a number to be filmed, and with the proceeds he was able to buy a large country house in Kent where he lived for nearly 20 years. He was twice married and left two surviving daughters. 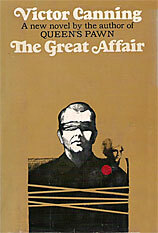 His novel, The Rainbow Pattern, was awarded the Crime Writers' Association Silver Dagger for 1972. The Great Affair sees ex-priest Charles Nelo Sangster, known as Nelo, going to visit his brother, a Member of Parliament, to demand a diamond necklace which he should have inherited from his mother. He plans to sell it and donate the proceeds to La Guicha, a nun who runs a French orphanage. His brother refuses, so Nelo recruits a safe-blower, goes to the house while his brother is away, blows open the safe causing a lot of damage, and sets off for Europe in the company of the unpredictable Sarah Minihane, a girl he had met after a cycling accident and with whom he thinks he is falling in love. A whole series of comic and/or absurd adventures then follow with such unlikely characters as Francois Xavier Mabluto, a secret agent (who in his time had been a "double, triple, quadruple and maybe far-more agent") and was now hunted by all the governments he had worked for, and the Bakata of Bakata (chief of a former British colony in Africa) along with his Archbishop, who obligingly marries him off to Sarah and re-ordains him so that he can have a big parish in Bakata "in our finest seaport where there is less malaria almost than in the capital" - assuming. of course, that their invasion attempt succeeds. There's even a James Bond-type glass tank, complete with observation room, that slowly fills so as to drown the victim - but Bond's adventures seem quite realistic by comparison! It is all quite entertaining, there are some amusing passages, and there's plenty of dramatic action, but basically it is all very silly. It is not normally regarded as one of Canning's better books. You just cannot take any of it seriously - nor, of course, are you meant to. Yet, according to Canning expert John Higgins (see link below), it is possible to read the whole thing as a sort of covert love letter to the woman with whom the author had just begun an affair and was about to leave his wife. 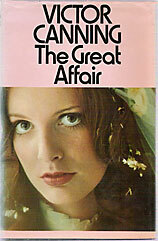 In that case, even the title, The Great Affair, may be a private joke! See the Victor Canning Pages by John Higgins. Neither the UK cover (above) nor the USA one (below) tells us much about the book.